Last weekend an international world-wide hackaton was organised by NASA: the Spaceappschallenge. In the Netherlands (where I live), the event was hosted locally at the ESA Business Incubation Centre. I participated with a small team of three programmers, two creative designers and a subject matter expert. We solved the Asteroid Prospector challenge, one of the many challenges set out by NASA to create world-wide awareness of (potential) technological advancement and investment opportunities. 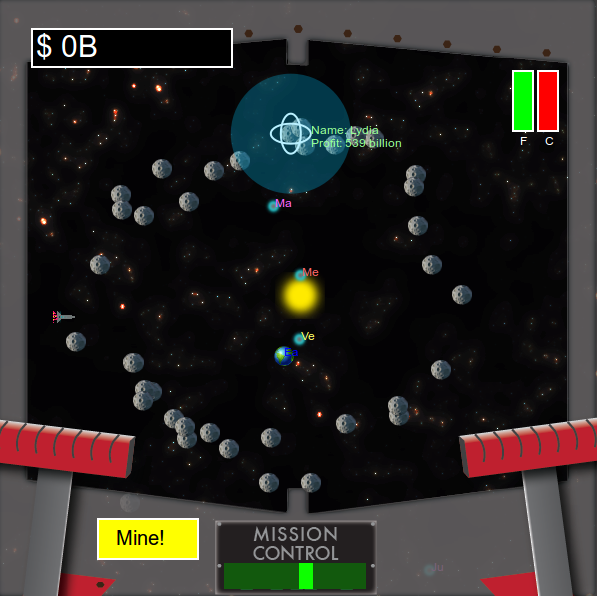 Asteroid Prospector involves creating a game about visiting the many asteroids in our solar system. Since asteroids are well known for their rich rare metals (much rarer than on Earth due to the lack of a molten core), we took the road of asteroid mining. The online accessible NASA/JPL Small body database provides information of tens of thousands of asteroids, featuring data of position, orbit, names, date of discovery, etc. We also made use of the Asterank api, build by an employee of a commercial asteroid mining company called Planetary Resources, containing estimate profits for each asteroid. We analysed the datasets and kept filtering out asteroids until we ended up with 38 valuable rocks in orbit between Jupiter and Mars. After two days of hard work; brainstorming, programming, designing, programming, scrapping features and more programming, we finally finished a playable single-player demo of our game: Profit One Trillion (the name was meant to be a working title, but it stuck). Multiplayer and AI were also planned, but we did not have enough time to finish it.